I grew up eating my grandmother's pie -- an open faced fruit tart on a shortbread crust. Yum. 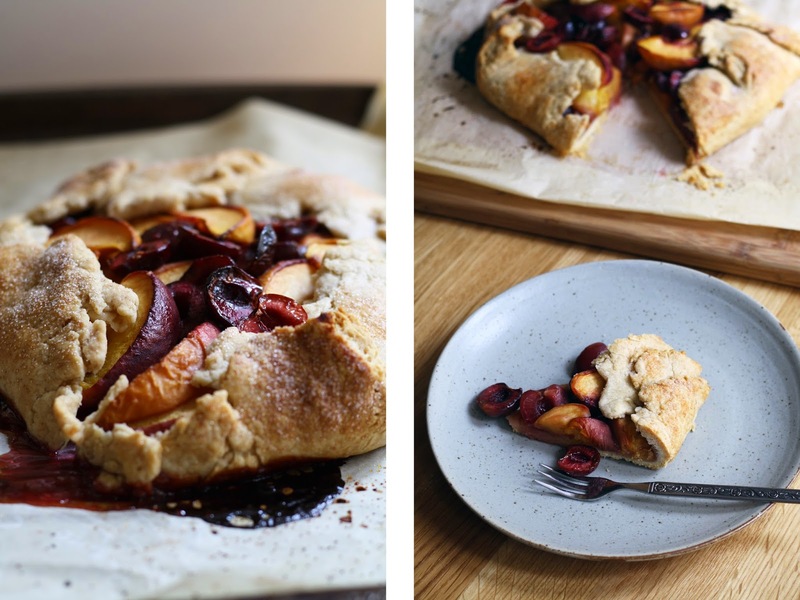 They are seriously delicious, and totally versatile -- blueberries, peaches, plums, apples -- you name it, the crust can handle it all. Everything I've heard about galettes leads me to think the same holds true for them; super forgiving, messy crust that can handle sweet or savoury fillings. I had never tried making a galette before, but figured it was time to try. When it comes to baking, I often find I do best when following a recipe, so after scouring the internet, I settled on a dough that required a bit more time, effort and butter, but guaranteed a flaky, 'fraisaged' crust. Two slices later I can assure you this recipe is well worth the effort! To make the dough, pulse the flours and butter in a food processor fitted with the s-blade, until the mixture resembles a course crumb. Continue to add the water, 1 tbsp at a time, until the dough holds together when pinched. Transfer the dough to a lightly floured counter, and gather it into a pile. To ensure a super flaky crust, use the 'fraisage' technique to work out the dough (super helpful 'fraisage' video here). Use the heel of your hand to smear the dough, in small increments, against the counter. Continue until all the dough has been worked and gathered into a pile. Repeat. Flatten the dough into a 6" disk, wrap in plastic and refrigerate for an hour. Remove the dough from the fridge and allow to sit for 2 minutes. On a piece of parchment paper, roll the dough into a 12" circle, transfer to a baking sheet and refrigerate for 20 minutes. As the dough is chilling, preheat the oven to 375 and prepare your fruit. 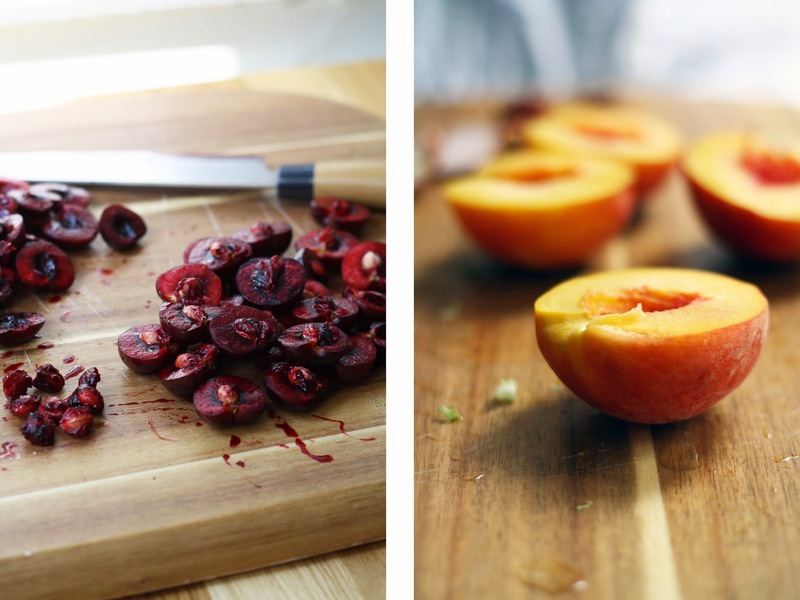 Toss the sliced peaches, pitted and halved cherries with the brown sugar. Set aside. 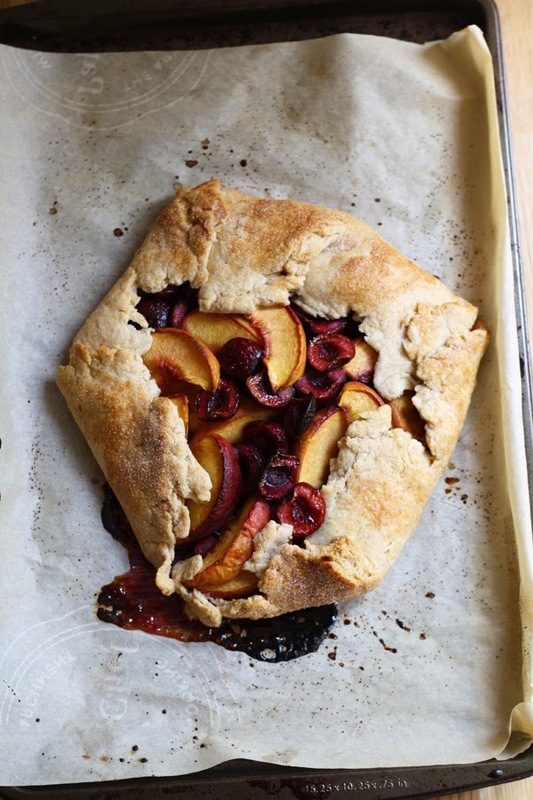 Remove the dough from the fridge and fill the centre with fruit - maintaining a 2" border. If you have too much fruit, set it aside for snacking. Fold the dough over the fruit, pleating and slightly squeezing as you go. Remember, galettes are rustic and messy, so no sweat if it doesn't look perfect. Brush the dough with water and sprinkle with 1/2 T white sugar. Bake for about an hour, until the crust is golden brown and the fruit is bubbling. Rotate the pan at 30 minutes. Allow to cool on the pan for 10 minutes, before transferring the parchment to a wire rack for about 20 minutes. Serve warm, preferably with vanilla ice cream.